Muzio Clementi is one of those composers whose name remains before the public rather more than his music is actually performed. He achieved a fame within his lifetime which has persisted, but how well do we know the music? In this respect he has something in common with Antonio Salieri. For Clementi was a composer of piano music who was and has been overshadowed by Mozart and Beethoven, whereas Salieri was a composer of operas who has been overshadowed by Mozart. What this enterprising recital tells us, in common with others in the catalogue, is that Clementi remains well worth hearing today. This CPO disc is well recorded and generously filled with more than seventy minutes of music. 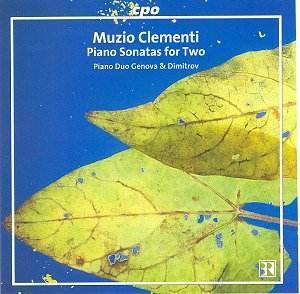 However, the approach Clementi brings to these sonatas, whether they be for two pianos or for piano duet, operates within a particular stylistic framework, and it is probably better to hear no more than one or two sonatas at a time. And why? For maximum enjoyment and edification it is the music, not the packaged product, that counts most. On that basis this CD brings excellent rewards. The music is most skillfully written for either combination: duo or two pianos, as the case may be. It is also expertly performed by Aglika Genova and Liuben Dimitrov, who frequently play together under the somewhat clumsy title Piano Duo Genova and Dimitrov. Perhaps their agent ought to have another look at that. However, their playing has marvellous sparkle and élan, and brings Clementi forward as a real talent in the context of the classical style. The first movements move along with vibrant momentum, and this is experienced in both the lively tempi and the textures too. The highlights tend to come in the Allegro movements � the finale of Opus 14 No. 3 is a particularly compelling example � but they find room for poetry also in the slow movements. These may not be profound in the way that Mozart and Beethoven can be profound, but they are well judged and eminently civilized. In a way the four hand music of Clementi makes for more compelling listening than his solo piano music. This is because the more complex textures bring interest in themselves. With its full and informative accompanying booklet, this issue is enthusiastically recommended.